The upcoming handover of a $4.5 billion Seme border facility to Nigeria and the Republic of Benin has increased hopes of smoother trade across West Africa and with third party countries.The European Union (EU) and Economic Community of West African States (ECOWAS) have embarked on a technical simulation of the new post, which will be opened for preliminary operations today, ahead of the official launch in September. Reports show that Nigeria will be the better for the initiative. The total trade of the West African region is about $300 billion. Exports are projected at approximately $137.3 billion, while imports total about $80.4 billion. The main active countries in trade are Nigeria, which alone accounts for approximately 76 per cent of total trade, followed by Ghana (9.2 per cent) and Côte d'Ivoire (8.64 per cent). The Guardian had in April chronicled how delay on the facility was hindering regional trade across the Seme corridor and aiding smuggling and illegal movement of goods and immigrants. Stakeholders say the new development would regularise the situation and ease the passage of goods through the approved route, which is aligned to checkmate corruption and bureaucracy. President of the National Council of Managing Directors of Customs Licensed Agents (NCMDCLA), Lucky Amiwero, said: "The border gate is a good development, but the facilities there should be seamless. The border should not be used as a smuggling base. It should be a gateway for legitimate goods. "We also have the ECOWAS Trade Liberalisation agreement. So, Nigeria should know that if we do not put our house in order, we would have negative effects from all these agreements because our infrastructures are poor. The roads, electricity supply and others are hindering product manufacturing. "It means that goods that are manufactured in Ghana for instance will move into Nigeria without paying duty. That is what we have been saying that Nigerian import, export and transit trade must be reformed so that our structure will be relevant to withstand the pressure that will be coming from other ECOWAS member countries." He warned: "If we don't reform our import and export procedures, we may continue to get negative results. You will just find that many companies will close shop, move to neighbouring countries, produce and bring the goods back to Nigeria to sell. It is already happening and will continue to happen if we don't act fast." Amiwero further urged the Federal Government to ensure the cargo scanner at the borders and ports are in good shape to ease trade.The Public Relations Officer, Seme Command of the Nigeria Customs Service (NCS), Seidu Nurudeen Abdullahi, said the EU/ECOWAS delegation was at the border to identify strengths and grey areas that must be fixed before the hand over, even as he confirmed that the facility would enhance trade across the region and aid customs in their operations. Chairman, Association of Nigerian Customs Licensed Agents (ANCLA), Seme Branch, Bisiriyu Lasisi Fanu, who was also at the event, said: "The official use might be around September, according to information from the authorities. We don't really know much about the arrangement yet. But from what I heard from the customs boss, it is most likely that diplomatic vehicles and some important people would use the gate temporarily, as a test case before the official opening." He said the post would reduce the number of vehicles passing through the former route, which is in a very bad state. It would boost trade and enhance the movement of vehicles across the border. "Incidences of vehicles getting stuck would be avoided," he said.Commending the initiative, Fanu added: "The sitting system is also helpful. Nigerian immigration, customs, health officers and their Cotonou counterparts will sit together in the same cubicle. This will ease the process and allow for easy movement across the border." The EU meanwhile has declared that the adoption of draft documents for the establishment of the Economic Community of West Africa (ECOWAS) Regional Product Certification Scheme (ECOMark) by the ECOWAS Commission is a booster to competitiveness.The adoption took place at the weekend in Abuja.Hailing the outcome, the EU explained that doors would be opened to products with the ECOMark seal, thus increasing trade within the region, across the continent and at global markets. The ECOMark standardisation certification is under the auspices of the ECOWAS Community Committee for Conformity Assessment (ECOCONF). It is implemented by the United Nations Industrial Organisation (UNIDO) with funding from the European Union worth €12 million. The EU ambassador to Nigeria and ECOWAS, Ketil Karisen (represented by EU First Secretary/Head of Section, Economic Cooperation and Energy, Ms. Nadia Cannata) noted that with the standards developed by ECOWAS and the growing number of manufacturing enterprises in the region, time has come to ensure that only quality products find their way to the ECOWAS market or get exported from the region. 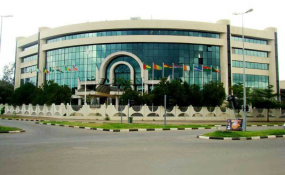 The ECOWAS Commissioner for Private Sector, Mr. Mamadou Traore, explained that the meeting was part of the implementation of the two main regulations adopted by the ECOWAS Council of Ministers in 2013 in Abuja and in June 2017 in Monrovia, Liberia.In a related development, the president of the Abuja Chamber of Commerce and Industry (ACCI), Adetokunbo Kayode, urged Federal Government to create industrial zones in all the 774 local government areas of the country. Making the call, while meeting Ondo State industrialists in Akure on Saturday, he also tasked the government to sign the African Continental Free Trade Agreement, saying this would enable Nigerians in other African nations to repatriate their wealth to the country.